At a certain time of year the common cold is all but unavoidable. And though it might not be a serious medical condition, it sure can sideline you. But what if you feel okayish? Maybe you want to continue exercising as normal while your cold runs its course. Or maybe you’re feeling dreadful, but think exercising will make you feel better. We explain when you should consider raising your hands in surrender and take a break from exercise and how modify your workout if you decide to workout. If you’re ever be in doubt as to whether you should or shouldn’t exercise, err on the side of caution and check with your doctor first. Exercise, of course, has an immune boosting effect so if you are a regular exerciser, you should get fewer colds anyway; especially if your diet is rich in essential vitamins and minerals. However, too much exercise can actually suppress your immune system and may increase your chances of suffering a cold. If you get a lot of colds, make sure you aren’t doing too much exercise and that your diet is supporting your immune system. Make sure to eat a varied diet with plenty of fruit and vegetables so you meet all your body’s nutritional requirements, which will help to keep your immune system in tip-top shape. Alright, first we need to differentiate between the common cold and the flu. Though they may appear to be similar, a cold is seldom serious, while the flu can, in certain circumstances, be life-threatening. Cold symptoms often start with a sore throats that might disappear away after a day or two. Your nose is next to capitulate, presenting with symptoms such as runny nose and congestion, and also a cough around days 4 – 5. Though fever is uncommon in adults, a slight fever is possible. Cold symptoms tend to last for about a week. However, it’s during the first 3 days that you’re contagious and you can pass the cold to others. It’s worth staying home from work and the gym, and catch up on some rest. Flu symptoms often mimic cold symptoms, but are usually way more severe and come on faster. You will feel absolutely miserable. Flu symptoms include sore throat, congestion, cough, headache, high fever, fatigue, muscle aches and soreness. Though most flu symptoms slowly improve over the course of two to five days, you might still feel run down for a week or more. Also, the flu can sometimes lead to complications such as pneumonia and bronchitis. So if you notice that you’re short of breath or things aren’t get better, see your doctor. If you have the flu, you need rest, not exercise. Stay at home and forget the gym for a week or two. You can’t ‘sweat out’ the flu, but you will probably make it worse, and may even do irreparable damage to your heart trying. In addition, the flu is highly contagious so going to the gym isn’t just bad for you; it’ll be bad for anyone you come into contact with. This communicability is also true of the common cold so if you are sneezing and spluttering everywhere, think twice before you inflict your germs on your fellow gym members! If you have the flu, then exercise is out until you’ve recuperated. However, a cold is much less serious, so it may be okay to exercise. But you still need to take care. As a general rule, if you have a mild cold and your signs and symptoms are all “above your neck”, you are probably okay to exercise. Having a runny nose, mild nasal congestion, sneezing or a minor sore throat needn’t preclude you from exercise. However, you may feel more comfortable if you lower the intensity and duration of your workout. Also consider doing more strength training and less cardio to allow for the fact your airways are congested. If, however, your symptoms are “below the neck” and specifically your chest, you should not exercise and are better off resting until your symptoms have abated. Below the chest symptoms such as coughing, wheezing, a tight chest, body aches, fever, diarrhea, vomiting, feeling weak or faint, fatigue, difficulty breathing or breathlessness at rest means you need to take a rest. And as your respiratory system is already under duress, adding exercise to the mix will only make things worse. 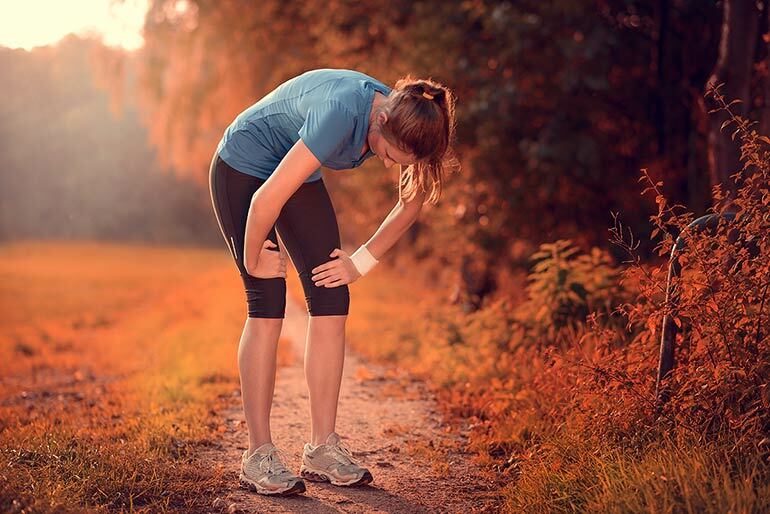 If you have a fever then exercising will only raise your body temperature further, which will make you worse. Let how you feel dictate how hard you exercise; not your normal schedule. Just because you had planned to run for an hour doesn’t mean you have to! Sticking slavishly to your schedule when you are unwell could delay your recovery, whereas an easy workout may enhance it. If you feel that you’d be better off delaying your workout for a few days until you feel closer to 100-percent, then listen to your body and take a break. Listen to your body, use your own energy levels as an exercise barometer. Once into the workout, check with yourself after about 10 minutes of starting exercise. If you feel fine, then continue, but if you’re not feeling good, stop your workout. Many cold sufferers use over the counter (OTC) cold remedies to alleviate their symptoms. These medications often contain caffeine to increase energy levels and decongestants to clear your airways. It’s important to remember that these products do not address the cause of colds but only the symptoms – you are still sick even if you don’t feel it. Taking a cold remedy before exercise just so you can do your normally intense workout is a very bad idea. While you may get through your workout, you could set your recovery back by days if not weeks. If you do choose to exercise while you have a cold, hit ‘cruise control’ and take it easy; this is not the time to be trying to set any personal bests! A cold needn’t signal a break from training but it does suggest that you’d be better off taking it easy for a couple of days. One or two easy days of exercise will allow your cold to do its thing so that you are then left feeling well-rested, refreshed and ready to return to full training sooner rather than later. If, however, you train through a cold, you may find your symptoms drag on for weeks. Listen to your body, act accordingly and your recovery will be much faster.